Every since Sametime 8.5.2 was released I have seen a continual problem with Sametime trusted ips that is still there in Sametime 9.0.1. The issue is that the trusted ips list (which tells the Community Server which server ips to accept connections from) is now entered into the Sametime System Console in WebSphere and not directly into the CommunityConnectivity document in stconfig.nsf. This means that since 8.5.2 the trusted ips in the Community Server configuration in WebSphere are then written to the Domino document at intervals. So what’s the problem? Well when WebSphere writes the list of trusted ips into the Domino document, it does so as a string, not as a list. 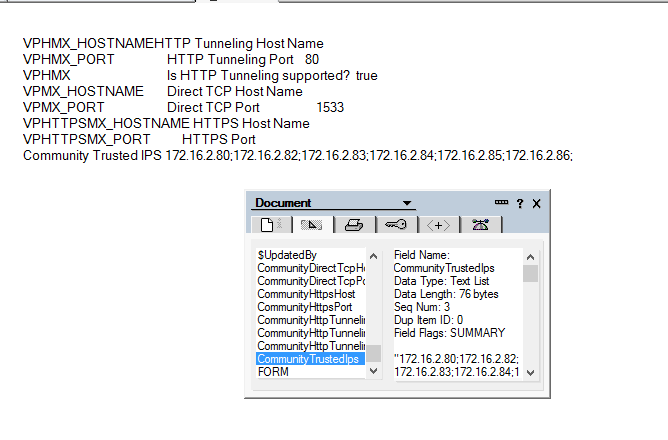 A small thing but that means when the Community server restarts the trusted ips don’t work as what Sametime sees is a long string instead of multiple values. To fix this I wait until WebSphere has updated and then open and save the CommunityConnectivity document which refreshes and parses the string with commas in it into a list (since the field is a multi value list field anyway Domino is smart enough to do that). Of course I then have to restart the server. Below are the examples of what I mean, first how WebSphere writes the values and secondly how Sametime needs to see them written. I first opened a PMR on this back in 8.5.2 days and have tried occasionally since then to open others but never got very far (around the time I am explaining Domino multi value fields to someone in China I lose the will to live). It always occurs if I have several ips to enter, not so much if there is just one or two. The annoying thing is remembering to check every time I make any change to the Community Server configuration (which isn’t often once it’s setup). Anyway, this has been my built in workaround for 3 years, it’s not hard and I know one of two other people out there have seen this too so here’s my “fix”…..